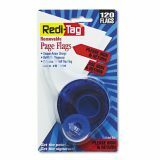 Redi-Tag Arrow Message Page Flags in Dispenser, "Please Sign and Return", Red, 120 Flags - Use removable flags anywhere you need to attract attention to sign and return. Simply apply Please Sign & Return" arrow-shaped flag where needed and remove the flag when the task is finished or the reference is no longer needed. Can be written on. 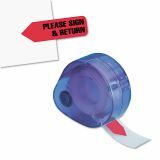 Dispenser can be refilled."